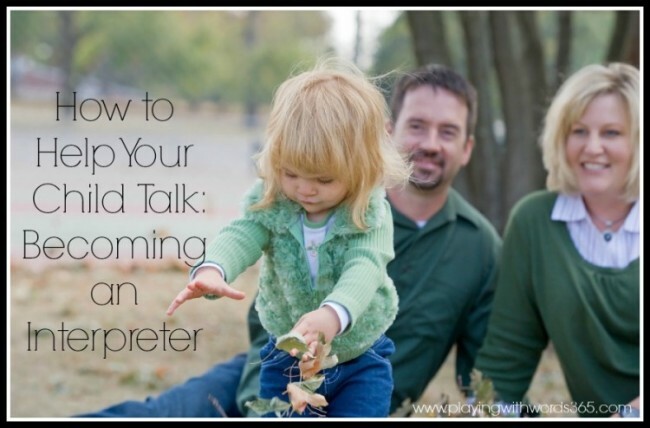 Welcome to my How to Help Your Child Talk series. These posts are intended to give you simple tips to help you work with your child so YOU can be your child’s best “speech therapist.” You may want to try out a new tip/strategy for a week or so and then when you feel like you’ve “got it” and it comes more naturally, move on to a new tip and incorporate that into your day for another week or two. For a list of all my tips, go HERE. This post contains affiliate links to Amazon for your convenience. In my last posts, we talked about the importance of slowing down and being present, getting down at your child’s level, listening with our eyes. and following your child’s lead. Today, I’m going to expand on the concepts of listening with our eyes and following your child’s lead and talk about how to interpret your child’s messages. The difference between speech, language, and communication and how communication is always our first goal. Speech and language learning happens in everyday moments and routines, all day every day. Our children can be different types of communicators and knowing what type of communicator your child is can help you help him move onto the next stage. The first step in helping our child talk is to slow down and be present. We need to take the focus off of the words, and listen with our eyes to our child’s nonverbal communication as it is just as important (if not more important) than their words. With a child with a speech delay, particularly with toddlers, the first step to getting your child to talk, often times has nothing to do with speech. Rather, we will want to first look at how your child IS communicating with you, and thenexpand and mold that communication into speech. It is important for YOU, as a parent, to learn to watch your child for those times when he IS communicating to you. Often times we are so busy watching for signs of speech, that we miss the many times our children are communicating to us. So today, we talk about how to interpret these communication messages so that we can eventually use them to help him communicate more effectively! We all know an interpreter is someone who interprets or translates someones messages to others. If we want to have a conversation with someone who doesn’t speak our native tongue, we need someone to interpret our message to our communication partner. Now, it is time for you to start interpreting your child’s messages so that you can respond appropriately. Remember how we talked about listening with our eyes and not just our ears? Now that we have become awesome at this skill, we are going to go into our interactions with our children listening with our eyes and ears and interpreting our child’s message from what we SEE and HEAR. You are going to interpret his message, based on your observations of your child’s ACTIONS, SOUNDS and VERBALIZATIONS. In other words: You are going to make an educated guess on what you think he is trying to communicate. Sit back and quietly observe your child, listen with your eyes and your ears. Take note of what is he DOING. Is he….spending a long time playing with something? Smiling? Reaching out? Looking at you? Looking at something else? Turning away from something? Gesturing towards something? Pointing? What might these actions MEAN? Take note of what SOUNDS he is MAKING. Is he squealing? Laughing? Babbling? Do you hear infections in his babbling? What might these sounds MEAN? Take note of what WORDS (if any) he SAYING? Now, put all this together and use your detective skills and see if you can figure out what message he might be trying to send. Believe it or not, you’ve been interpreting your child’s messages from the day he was born, although you may not have always said them aloud to him. When he cried, you interpreted that to mean he needed to to eat, or needed a diaper change. When he smiled and laughed when you bounced him, you interpreted that to mean he liked the activity and wanted more. In toddlers with speech & language delays, we need to continue to interpret, or guess the meaning of, his non verbal and verbal language so that we can expand on the skills he already has and give him the words he needs. Scenario one: Your toddler is playing with some toy cars. He reaches out towards a car near you, then looks at you, and then back at the car. Scenario three: You are pushing your child in the swing and ask him “Do you want more swing?” He smiles and kicks his feet. Possible interpretation: His questioning inflection makes you think he is asking something. Your first thought may be that he is asking for blue playdoh. But remember how he was trying to flatten the dough? Maybe he was actually asking for the roller, which is blue. This is why is is so important to listen with your eyes and not just your ears, because oftentimes, especially when there is little speech, a child’s nonverbal language is telling us so much more! What to do with Our Interpretations? So, what do we do with these interpretations? We will need to respond! That is coming up next. For a list of all my other tips, go HERE. Looking for more ways to help with your child’s speech and language development? ? I highly recommend these two books: My Toddler Talks: Strategies and Activities to Promote Your Child’s Language Development by fellow SLP and friend Kim Scanlon and It Takes Two To Talk: A Practical Guide For Parents of Children With Language Delays from The Hanen Centre.